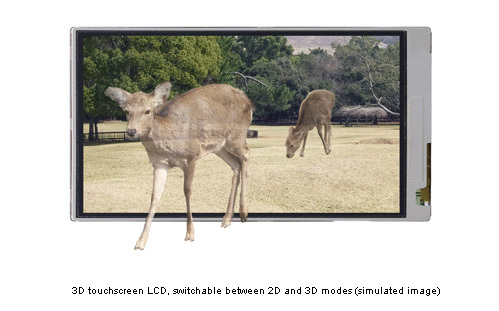 The 3D LCD developed by Sharp at this time significantly improves image quality by achieving both high brightness and low crosstalk thanks to advances in CG-Silicon technology and optimization of the parallax barrier. Advances in CG-Silicon technology have shrunk the wiring width within the LCD panel, allowing more light to pass and doubling the brightness (to 500 cd/m2, the industry’s highest) compared to the conventional model. In addition, optimizing the parallax barrier design has increased the efficiency of light, thereby dramatically reducing crosstalk. Also, the thickness of the LCD module is about the same as conventional 2D displays even though it is a touchscreen display. As 3D images can be displayed in both portrait and landscape screen orientations, it is ideal for sophisticated mobile devices such as smartphones.